Veterinary staff treated her for a fractured pelvis. An Alberta puppy has a new lease on life after it was rescued from a ditch over the weekend. 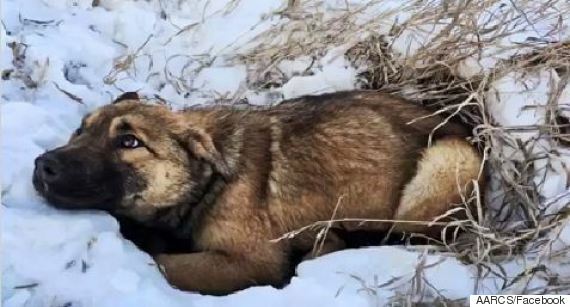 According to the Alberta Animal Rescue Crew Society (AARCS), Nutmeg was found on the side of the road lying in a pile of snow after she was hit by a car. 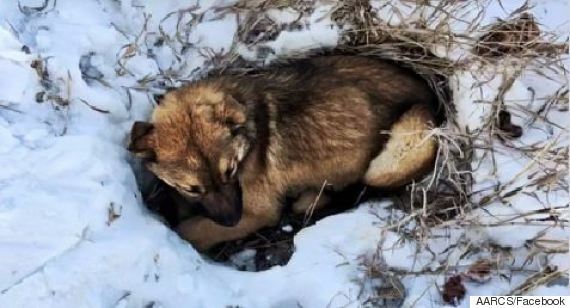 "It is suspected that this poor gal spent over 12 hours lying there alone and cold before rescuers found her," the rescue organization said in a Facebook post. Staff at the Southern Alberta Veterinary Emergency clinic in Okotoks treated the pup for a fractured pelvis, and she will be on strict crate rest for the next six weeks while waiting for her bones to heal. In November, AARCS treated a similar case when a fourth-month-old dog was found in a ditch with two broken front legs. It's suspected the puppy had been attacked by a wild animal, but when contacted, the dog's owners said they could not afford to pay the medical bills and the dog was surrendered over to AARCS, reported CBC News. A downturn in the Alberta economy largely driven by a drop in the price of oil has meant an uptick in the surrender of animals, as people are forced to part with their pets. "It's the last thing they want to do. Typically they will go without a lot of things ... without food ... maybe they'll skip rent for a month if they have to," Sage Pullen McIntosh, spokeswoman with the Calgary Humane Society, said in an interview last September. She also said some people are letting their animals go as strays, because the "they feel embarrassed ... they feel ashamed," about not being able to provide for their furry friends. AARCS told CBC News the economic downturn has left their organization struggling to keep up with demand. More animal surrenders means more animals requiring medical care, spay/neuter surgeries and vaccines — all expensive treatments that have left the rescue group feeling the pinch. The organization is currently raising funds for a new veterinary hospital. As of Tuesday, they had reached 30 per cent of their $500,000 goal.